With more than 5,000 independent retailers, True Value Company is one of the world’s largest retailer-owned hardware cooperatives. True Value offers its retailers training, support, and technology to help each retailer meet its customers’ needs. For over ten (10) years, True Value has provided its retailers a web application called TruSite. TruSite is a popular program that allows retailers to maintain their own website content. 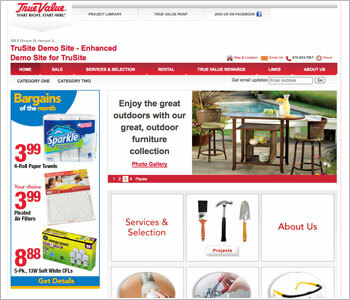 In 2010, True Value and Engage launched a new, enhanced TruSite platform using DotNetNuke (DNN). The project had a simple guiding principle – maintain consistent brand standards while allowing retailers to make their site personal. By leveraging a number of features inherent to DNN and extending the platform, True Value is able to provide retailers the tools to create and manage their own feature-rich content. Additionally, the True Value marketing department is able to provide a robust set of starter content to ensure brand standards and keep content current and relevant for all retailers. From the onset of the project, True Value stressed the importance of maintaining an upgrade path for the core DotNetNuke framework. This allows them to benefit from the ongoing work in the DNN community. These requirements were easily satisfied by leveraging the extensibility of the framework to meet the robust needs of TruSite. Additionally, True Value utilized many of the features core to DNN to allow us to focus on the requirements that were truly unique to TruSite. True Value emphasized the importance of their retailers’ user experience from the start of the project. Knowing that the success of this program would be determined by the adoption of their retailers, the site had to be intuitive and interesting. The TruSite Builder uses modern technologies (modal pop-ups, rotating content, interactive maps) to allow retailers to manage content without having to know the first thing about web development. By providing a consistent set of administrative tools, the TruSite Builder provides repeatable administrative activities in a variety of settings to greatly improve the user adoption of TruSite by reducing the learning curve. By integrating with True Value’s retailer extranet, TruSite offers retailers a seamless, single sign-on solution. Retailers access their TruSite with a familiar login and are able to manage their site from the same place they receive new updates from True Value. Better yet, store information is directly pulled into the retailers’ sites by integrating with True Value’s member information database. Retailers are able to quickly verify their contact information, update program involvement and even validate their address in Google maps. The core features of DotNetNuke allowed True Value to quickly add to the rich features of the system while customizing to meet the specific requirements of TruSite. By enhancing the features of file management, retailers manage images on their site with an easy, point-and-click image carousel. Furthermore, TruSite integrates an existing image management application allowing retailers to upload, resize, and crop their images for use on their site. Both file upload and file management are native features to DNN, but by extending these features True Value was able to provide tools that better met their requirements. The marketing department further enhanced the image carousel by pairing content with images. This allows retailers to inherit well-crafted messaging with the professionally designed, web-ready images then tailor the message to uniquely reflect their store’s promotions. Maintaining consistent branding across all of the True Value retailer sites was one of the main project objectives. True Value wisely realized the benefits of multi-portal capabilities within DotNetNuke. These features enabled True Value to maintain shared image libraries while allowing each retailer the isolation of their own website. The shared libraries allowed the marketing department to develop a robust set of design assets from which their retailers utilize in managing their content. Since each site operates separately, retailers can personalize their site and create content unique to their store. True Value takes advantage of the template capabilities in DotNetNuke to quickly on-board retailers into TruSite. TruSite uses site templates to establish the initial page structure that serves as the foundation for content. Style guides are managed in a single location across all retailer sites to help maintain brand standards. From a maintenance stand-point, the TruSite system maintains a single upgrade path for its custom extensions allowing the IT department to efficiently respond to enhancement requests and new features. From custom modules to style sheets, all retailers share a single code base.